It’s been awhile since we’ve done one of these, so I thought I’d share a few shots from an August visit to the Allen County, Indiana Amish settlement. 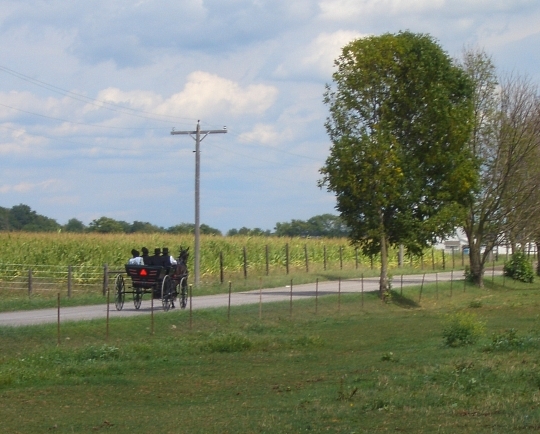 The Allen County community is the 5th largest in Indiana and one of the two large Swiss Amish settlements in the state. Hope you enjoy the photos, any observations? View other 10 views photos here. Being a Hoosier myself, I think it is great to see the basketball hoops! I guess Hoosier Hysteria knows no religious or ethnic bounds! Vicki, Hoosier basketball fever extends even to the state’s Amish. This community is full of hoops. 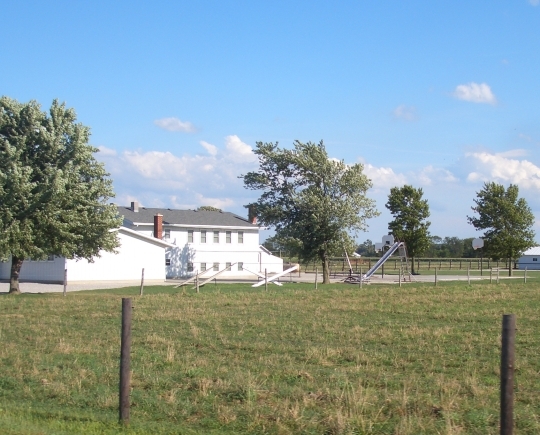 And it’s not the only Indiana Amish settlement where the youth play a lot of b-ball. Are those solar panals I see? I also giggled over all the basketball hoops. It must be a popular sport in that area. Karen, yes, you see a LOT of solar in this community. Very nice hoops here, as you can see, even full courts! Love the wind power turbines; very progressive. Denise five years had passed between this and my previous visit. The addition of a lot of wind turbines here was one thing I immediately noticed. They are becoming more popular among Amish in general. I visited an Amish-owned retail place that sells a lot of household enhancements like this (grills, solar, etc) near Shipshewana. They had a number of sizes for sale as well. You also see them in the Lagrange/Elkhart community. Compared to some other Amish settlements I’ve seen, this community seems to be rather “well off.” Perhaps the ones I’m more familiar with are of a lower order (Never seen “real” basketball goals before. 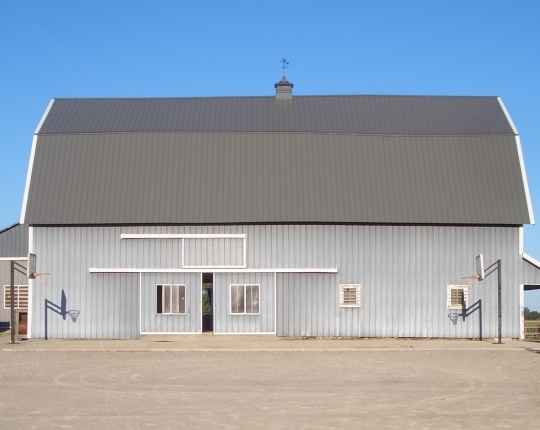 The ones in front of the gray barn are really nice – and a little frivolous!). The buildings and farms are very neat and symmetrical; this may be a sign of prosperity or it may be a legacy of Swiss emphasis on tidiness and precision. The basketball hoops didn’t surprise me, having seen them in other photos on this blog, but I am really impressed with the turbines and solar panels. 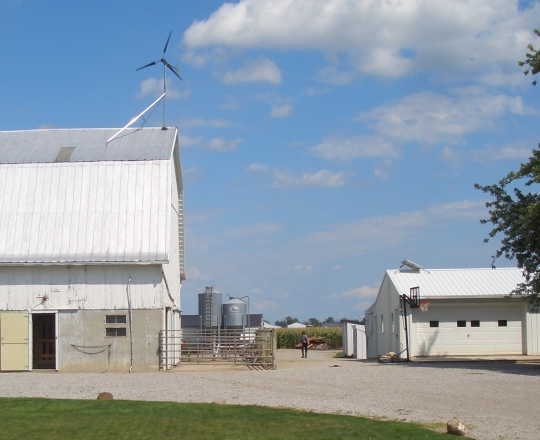 I’m only familiar with the humongous turbines you see in farm fields (my son-in-law’s employer has one in a field not too many miles from me, visible to anyone coming into Woodstock, IL on Rte. 14,from the East), but those smaller ones look like something you might be able to have in a residential area, depending on “ordinances”. I’d like to look into those! 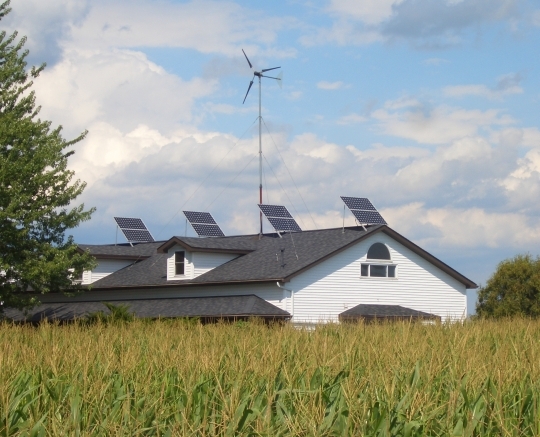 Do the Amish use solar & wind power mainly for lighting, or other purposes? Has anyone in the Amish community written any books/etc. on THEIR use of (and experience installing/maintaining) solar/wind power that anyone knows of? Thinking of all those people out East who were (are) affected by the freak October snowstorm that knocked out power for so long, solar/wind power would be a cleaner alternative to running lights (or more?) versus using gasoline powered generators. This makes the Amish look quite progressive, at least the ones you’ve featured here, Erik! 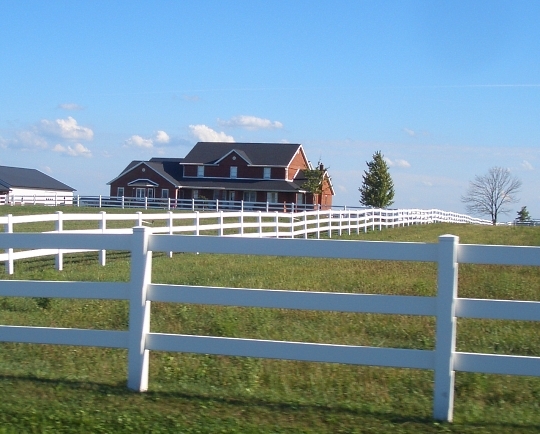 It’s a relatively wealthy community, which becomes obvious when you drive around a bit (it starts right on the edge of Fort Wayne, which is not exactly back-country cheap real estate either). Materially they do accept quite a bit here, though there are what you’d conservative elements (the Swiss Amish custom of open buggies, some outhouses; also Swiss are more conservative in some ways). Not exactly a tourist-friendly place, though Grabill in the center is a nice little town. It was a fantastic beautiful day when I shot these. Alice Mary on Amish-written materials/books on solar/wind, I’m not sure of anything outside of possible shorter pieces, what you might find in Amish monthly publications. It is an issue, and like other innovations, this type of technology is still being debated in some places. I really like the open buggies, though I can’t imagine I’d like riding in one in the rain or snow! Really love how everything is very neat and in order in these pictures. Like to see the solar panels and wind turbines! The thing that stuck me the most in these pictures is the red house. I’m guessing it is brick and not painted red since the most of the other buildings are white. I really like that house! 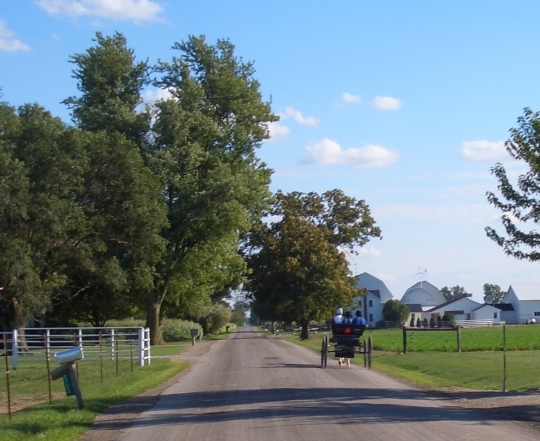 All Amish communities look so clean and orderly and in good repair. Beautiful! Lissy M, a hoosier is an Ohio basketball team name. Very popular and well known across the country. I love the power wind turbines and the solar panels. I always knew the Swiss amish group was more pregressive than the other Amish groups. More wealthy and different type of work there. I also noticed the difference in the homes compared to other parts of the country. Im of Swiss ancestory and would enjoy going back and meeting some of these people. Probably some of my own relatives back there. A “Hoosier” is anyone from/that lives in Indiana. Basketball is our middle name. We live for Friday night high school basketball games….Basketball goals are so common I didn’t even notice them in the picture. 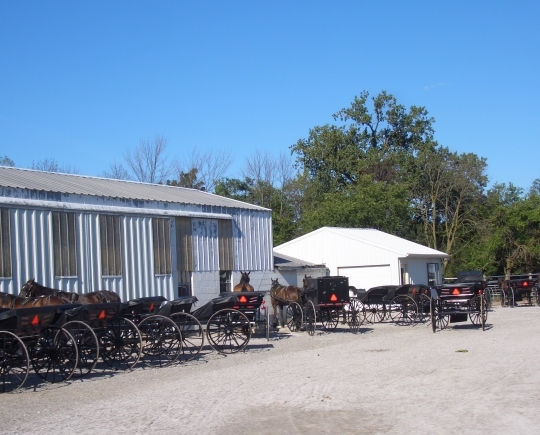 Many Allen/Adams Co. Amish work in the RV factories and I believe that is one reason for their “prosperity”, although in recent years there have been many RV jobs lost. There are also many Amish construction crews from these counties. I would go one step further than Lida and say that not only is basketball our middle name, it comes very close to being the official state religion. Small children in Indiana are usually given a plastic toy basketball hoop and basketball by the age of five as a present for birthdays/holidays. 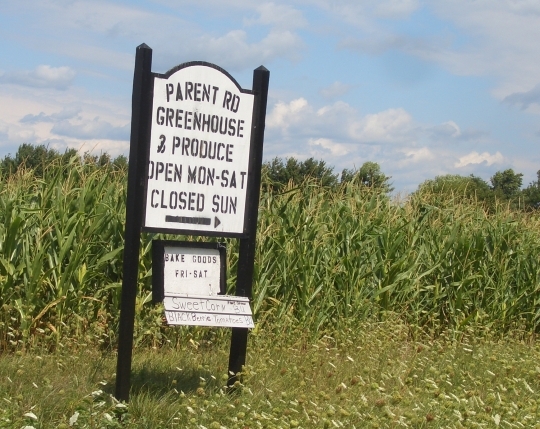 Next week we are traveling to Auburn, Indiana, which is near Berne and Grabill. I believe all three are Amish communities. Does anyone know much about these communities like where to eat, places to visit, good place to stay? To those discussing the origin of the word Hoosier, I’ve also heard a theory that a guy who’s last name was Hoosier sent workers into Indiana from Kentucky during its early days. 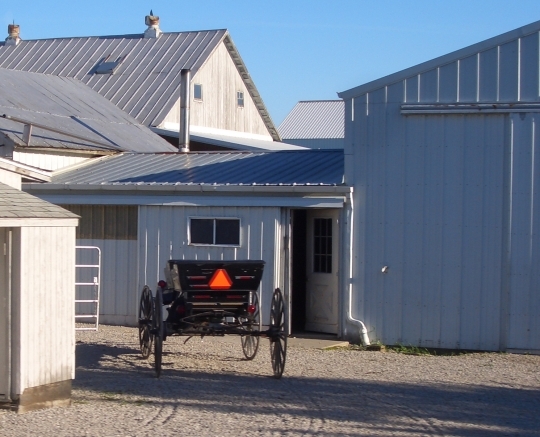 What are your Indiana Amish favorites?